A smaller belly and a healthier body can be yours in just 14 days. This easy-to-follow, six-step program of healthy eating and movement helps readers lose at least 7 percent of their body weight to slash their risk of diabetes by 60 percent. Boost Your Metabolism & SHRINK YOUR BELLY -- FAST! You can have a healthier and leaner body in just 14 days. And the health benefits start on Day 1 when you begin to reduce the amount of added sugars in your diet with The 14-Day No Sugar Diet. Obesity and type 2 diabetes are real risks for you and your family: The typical American diet is high in processed foods filled with added sugars that trigger cravings for more. You can eliminate those risks and forge a new path to better health by following this simple 6-day plan. Research shows that shedding just 7 percent of your body weight -- about 11 pounds for a 165-pound woman -- cuts diabetes risk by more than half! You can drop those pounds in just 2 weeks without starving, without sweating for hours in a gym, and without giving up the foods you love. * Lose stubborn belly fat--up to a pound a day! * Reduce your risk of type 2 diabetes by as much as 60 percent! * Stop sugar cravings with a delicious meal plan you can enjoy for life! * Sleep better and feel younger, lighter, and happier. * See a slimmer, fittter you in just days! Featuring easy meal plans and exercises, plus more than 50 delicious rescipes, The 14- Day No Sugar Diet is the perfect solution for anyone who wants a flatter belly and a healthier body -- fast! Eat This, Not That! books have changed the way the world eats--and have helped millions of men and women lose weight, sometimes up to 70 pounds or more. The blockbuster series, with its pop culture attitude, shocking food swaps and proven "no-diet" weight loss strategies, continues to top the charts, with titles devoted to restaurant menu survival, supermarket shopping guides, healthy pregnancies, and rapid weight loss. Oprah called Eat This, Not That! 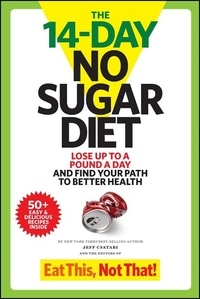 "a great guide everyone should get" and Ellen DeGeneres said "Eat This, Not That! will freak the weight right off of you!"